Collectible Items – Including Equipment, Food Caches, Weapons and Weapon Parts, Ammunition, Salvage, Documents, Relics, GPS Caches, Treasure Maps, and Challenge Items. You can change the controls to suit your play style in the Button Mapping section of the Options menu. Follow this link for downloadable PDF manuals. In addition to the general, spoiler-free information on this page, detailed lists of Skill, Gear and Weapon Upgrades, Collectible Items, Unlockable Extras, Outfits/Skins and Other DLC, Steam and Xbox 360 Achievements, PlayStation 3 Trophies, and my Guide to 100% Completion are on separate pages. NOTE: I haven't played the multiplayer game yet. Apparently the controls are similar to the single-player with a few minor exceptions, such as crouch, sprint and roll. Check the in-game controls menu for details. I will not be doing a multiplayer guide for this game. If you would like to take on this project, I will gladly consider hosting it here. Meanwhile, here's a great video guide to multiplayer by SyncingShip. Keyboard: Hold Ctrl and press direction keys/buttons to walk. Console players: Press lightly on the control stick to walk; press firmly to run. Press Jump along with a direction to jump that way. If there's a ledge or handhold nearby, Lara will grab it automatically. To scale a wall slightly higher than Lara's head, stand facing it and tap Jump twice. Press this button while moving in a direction to scramble along the ground or to dodge an enemy attack. Tap this button twice while moving to roll along the ground. Later in the game, You'll unlock the ability to roll after falling to reduce injury. Certain enemies are more easily defeated using dodge maneuvers. These are described briefly under Combat below and in more detail in the walkthrough. This skill can be improved in various ways with unlocked upgrades. Pressing this button while near the top of a ladder or a ledge that Lara can grab makes her drop and hang on. Not all ledges can be grabbed, though. Note: There is no separate control for crouch in the single-player game. 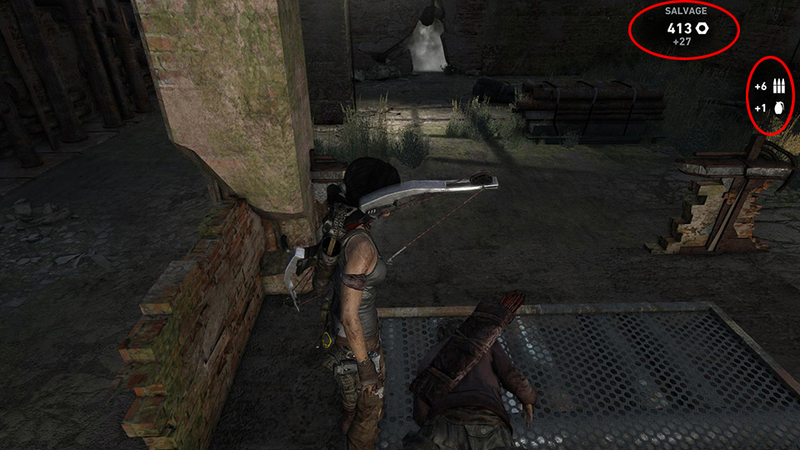 When Lara enters a tunnel or moves under a low ledge, she crouches automatically. Press or press and hold briefly to interact with certain objects in the environment (e.g., to light torch at a fire source, ignite objects with your torch, loot bodies, etc.) In such cases you'll see the Interact button icon appear on screen when you approach the object. Once you've obtained the climbing axe, Lara will be able to use it to scale certain climbable surfaces. Jump toward one of these surfaces and press Interact to sink the axe into it. Once Lara is latched on, you can release Interact and climb using the direction buttons or left stick as usual. If Lara loses her grip while climbing, with or without the axe, the Interact icon will flash on screen. Press it quickly to prevent her from falling. The map screen also contains various information about your mission status, objects found, challenges completed, etc. See the Map/Objectives section below. After you've obtained the torch, stand near a fire source and hold Interact to light the torch. Later you'll obtain gear that lets you light the torch at any time simply by pressing Interact. To extinguish the torch, press Dodge. Sometimes this doesn't work. In these cases, just draw a two-handed weapon, like the bow, and Lara will stow the torch. Press and hold to draw the currently selected weapon. Then move the mouse or right stick to aim. NOTE: There's a limited auto-aim feature if you set the combat difficulty to EASY. Each time you release Aim and then press it again, Lara will automatically aim at a nearby target. If that helps, by all means use it, but I found it easier to just re-train myself to use the stick/mouse to aim. Later in the game, when you're besieged by multiple enemies, you'll need to be able to do this. While holding Aim, press this button to shoot. When using the bow, press and hold Fire for a few seconds to power up a charged shot. Then release the button for a shot that does extra damage. To cancel without firing, release the Aim button. Once you've unlocked rope arrows, aim the bow as usual then press Alternate Fire on the controller or Space Bar on the keyboard to fire them. Lara will usually then yank on the rope automatically, but if not, you can press Interact (E/Square/X) to pull. PC players using keyboard and mouse, please see the note about the mouse wheel below. If you have unlocked rope arrows in the game but find they are no longer functioning, see the note below. When close to an enemy press this button for a melee (hand-to-hand) strike. Later, when Lara obtains the climbing axe, use this button to hit opponents with it. After unlocking certain upgrades, you'll gain the ability to deliver special finishing moves. (See Combat, below, for details. 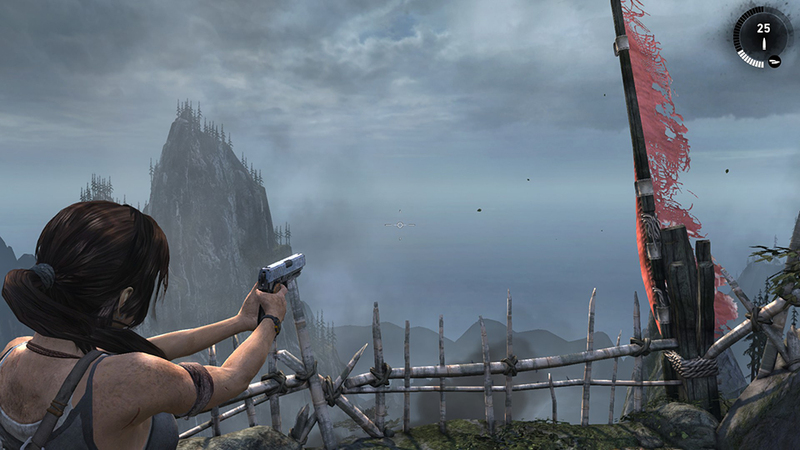 Press C on the keyboard or click the left stick to change the direction in which Lara leans while aiming. This will help you shoot more effectively from cover. Press and hold Aim (above). Then press Z on the keyboard or click the right stick to zoom in. Press again to zoom out. While holding a weapon press this button to reload. Sometimes in combat you'll see the reload prompt on screen as you're about to finish off a clip, but you can also reload at any time, provided you have ammo for that weapon. When you first obtain the bow it will be your only weapon for a while. Simply press Aim (above) to select it. After you've obtained other weapons, if you want to switch back to the bow, press 1 on the keyboard or Up on the D-Pad. Once you have obtained this weapon in the game press 2 on the keyboard or down on the D-Pad to equip it. Aim and fire as usual. When you've unlocked modifications like the silencer, press this button multiple times to cycle through the available modifications. Once you have obtained this weapon in the game press 3 on the keyboard or left on the D-Pad to equip it. Aim and fire as usual. After you've unlocked Incendiary Shells, press this button repeatedly to switch between regular and incendiary shells. Once you have obtained this weapon in the game press 4 on the keyboard or right on the D-Pad to equip it. Aim and fire as usual. When you've unlocked modifications like the silencer, press this button multiple times to cycle through the available mods. PC only. Players who use a mouse with a middle button that also serves as the mouse wheel may find it helps to reassign the Alternate Fire button. Then you won't accidentally switch weapons when pressing Alt Fire. BUG NOTE: Several PC players have reported problems using rope arrows. First, you cannot use rope arrows until you've unlocked them. This happens automatically during the Cliffside Village part of the story. After that, you should be able to fire rope arrows as described under "Alternate Fire" in the grid above. You don't need arrows in your inventory to use rope arrows. If this doesn't work or stops working after a while, there may be a glitch with the controls. Try resetting the controls to the default settings under Options > Button Mapping. If you find rope arrows aren't working in a particular spot where you know they should work, try reloading your last checkpoint. In most cases, that should fix the glitch. When you start a new game, you will be prompted to choose a from three difficulty levels: Easy, Medium or Hard. This affects the toughness of enemies and Lara's vulnerability to injury. It can be changed at any time in the Gameplay Options section of the pause menu. To change language in the PC version, open your Steam Library, right-click on Tomb Raider in the list of games, and choose "Properties." Then in the pop-up window, click the "Language" tab. That will give you a list of languages you can choose from. Pick the one you want and then click Close. The game should then download and install the correct language pack, so you need to be connected to the Internet with Steam in Online mode in order for it to work. As you advance through the game, it saves your progress automatically. You'll see the 'TR' logo at the bottom right corner of the screen each time it autosaves. If Lara dies, the game reloads at the previous checkpoint. If you quit the game and return later, just click the Continue option in the main menu and choose the save you want to load. You cannot save manually. Each time the game autosaves, it overwrites the previous autosave. In order to keep more than one save file, you need to use the Change Save Slot option in the pause menu, accessed by pressing Esc on the keyboard or Start on the controller. There are 3 save slots to choose from in the console games. The March 25 patch upgraded the PC game from 3 save slots to 99 and also added a separate "Last Campsite" autosave. I highly recommend changing your save slot at least once every level or so. If you're playing on one of the consoles, you may also want to periodically back up the 3 autosaves onto a memory card. If you're using the PC version, you can back up your autosaves into a separate folder using the instructions on the TOMB RAIDER save files page. I have not experienced any major glitches in this game, but if you back up, you'll have a choice of save files to rely on if something does go wrong. I also have a collection of PC save files for download in case you get stuck. As you explore the game world, you'll find a number of Base Camps. There are two types of camp: Fast Travel Camps and Day Camps. Approach a camp and press Interact to rest there. This opens the Skills Menu, where you can spend any skill points you've earned to upgrade Lara's abilities. See the page on Skill, Gear and Weapon Upgrades for details. Once you've progressed in the game a bit, resting at a camp also provides access to the Gear Menu (see Equipment/Gear Upgrades for details) and Fast Travel Screen. 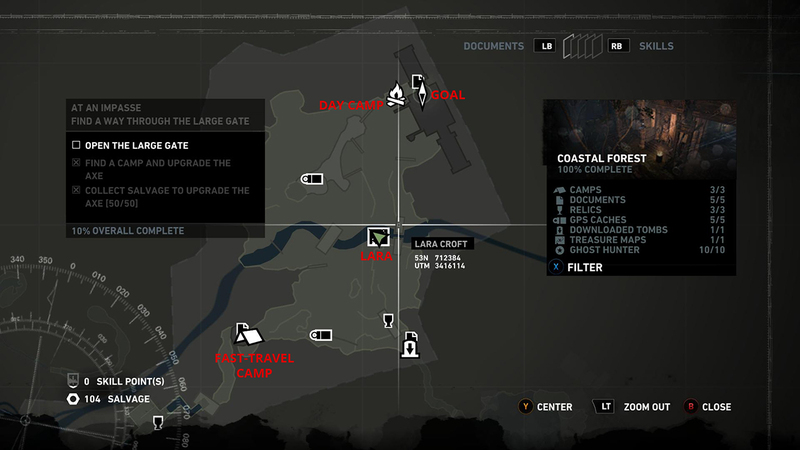 Each time you locate a Base Camp during gameplay, it appears on your Map Screen. Fast Travel Camps are indicated by tent icons. Day Camps are indicated by campfire icons. Both types allow you to upgrade Lara's skills and gear (once you've earned the ability to do so). Fast Travel Camps also allow you to move instantly to any other Fast Travel camp on the island (once you've unlocked the ability to fast travel). This allows you to return to previously visited areas to explore further without losing your progress in the game. To use Fast Travel, approach a camp site and press Interact to rest there. Select the Fast Travel option to open the Fast Travel map. Then press Left/Right to cycle through all of the Fast Travel camps you've discovered so far. When you have selected the camp you want, press Interact to go there. To continue the story, just find a Fast Travel camp and use the same process to get back to the area where you left off. Note that camps in areas you haven't been to yet will not appear on the map. Unlike past Tomb Raider games, there is no health bar in this game. Lara's health/injury level is indicated by how she looks and moves, as well as by grime/blood spatter on screen during action sequences and combat. When she is badly injured, the screen fades to black and white. (screenshot) If Lara then takes more damage, she'll die. There are no health packs either. Lara's health regenerates automatically over time. So once she stops taking damage, she'll recover after a bit. Consequently, it's important to seek cover in heavy combat situations in order to survive. There is a brief overview of combat mechanics below, and the walkthrough includes tips for each battle. Unlike past games, Lara no longer has unlimited ammo for any of her weapons. You must find arrows and bullets while exploring. When you find a bundle of arrows or a box of ammo, stand near it and press Interact to add it to your inventory. Searching the bodies of slain enemies will often yield ammo as well. Lara's carrying capacity for each ammo type is limited, but increases as you unlock various upgrades. There's more info under Hunting and Combat, below, and on the Upgrades page. After you've hunted for a while in a given area, a message appears on-screen telling you the region has been "Hunted Out." After this, you'll only gain 1 XP for each kill. However, once you unlock the ability to use Fast Travel, you can return to previously visited areas and hunt again. You'll receive the full XP value for each kill until the region is once again depleted. Once you've unlocked the Arrow Retrieval skill, you can get back most of the arrows you use for hunting by looting your kills. When you reach the point in the game where you're able to use Rope Arrows, you can also cheat a little by using them for hunting. Shooting a rope arrow doesn't expend any ammo, but can kill small prey like birds and rabbits as long as they're not too far away. There are a few hunting-related Achievements/Trophies. These are covered on the relevant pages. Basic combat works the same way, although naturally it's much more challenging when your quarry fights back. The first dangerous enemies Lara encounters are wolves. The walkthrough for the Coastal Forest also includes tips for handling them. Later, as you begin to meet tougher foes, you'll also unlock advanced fighting skills and more powerful weapons. The game does a great job of providing tutorials as you progress, so I'll just do a little recap here. Basic Ranged Combat – To shoot an enemy from a distance, first select a weapon. At first you don't have many choices, but eventually you'll fill all four weapon slots: bow, handgun, rifle and shotgun. Press Up, Down, Left or Right on the D-Pad to switch between weapons. Or, if you're playing with keyboard and mouse press 1, 2, 3 or 4, or scroll the mouse wheel to select a weapon. Hold Aim (Right Mouse/L1/LT) and then use the right stick or mouse to aim the reticle at your target. If there's time, you can press Zoom (Z/R3/Right Stick button) to get a closer view. Press again to zoom out if necessary. Then press Fire (Left Mouse/R1/RT) to shoot. If you're using the bow, you can briefly press and hold the Fire button to build up a charged shot. Lara won't shoot until you release the button, but she can only hold a charged shot for so long before her arm fatigues and she's forced to let the arrow fly. To cancel a charged shot without firing, just release the Aim button. Charged shots do more damage than normal ones, so learn how to use them. Later as you unlock various weapon upgrades, you'll add to your ranged combat repertoire. Melee Combat and Brawler Skills – Lara's hand-to-hand combat skills also start out at a very basic level and improve over time. Early on, you can shove enemies who get too close by pressing the Melee button (F/Triangle/Y). This throws them off balance briefly, giving you the opportunity to shoot. One of the Rookie-level Brawler skills is Dirty Tricks. Once you've unlocked it, when an enemy gets too close, press the Dodge button (Shift/Circle/B) to scramble out of his way, then press Melee (F/Triangle/Y) to throw dirt in his eyes, blinding him temporarily so you can finish him off. About a quarter of the way into the game, you'll unlock the ability to use the axe as a weapon. At this point, you can stand near an enemy and press Melee to strike with the axe. Later, you'll unlock refinements for this skill, which will allow you to wield the axe in more deadly ways. Additional special moves are covered in detail on the Upgrades page. Stealth Kills and Headshots – Lara is smaller and weaker than most of her opponents and often ends up fighting alone against multiple enemies. Rather than brute strength, she uses her wits and agility to get by. Stealth is one aspect of this. Lara automatically goes into a stealthy crouch when enemies are about. As long as she stays out of their line of sight and doesn't make noise (like firing a gun), enemies won't notice her. She can then pick them off one by one or at least eliminate a few before taking on a larger group. Eventually I'll make a video covering all these techniques, but for now, the Mountain Temple walkthrough teaches the basics of stealth attacks, headshots and distraction. So check that if you need a review with screenshots. To perform a stealth kill, first make sure the enemy is facing away from you, so he won't see Lara approach. Press Survival Instinct (Q/L2/LB) and check that the enemy you're targeting glows white and not red. Enemies who glow red will alert others when attacked. Then sneak up on him. When you get close enough, you'll see the Melee icon above the enemy's head. Press that button (F/Triangle/Y) to get the guy in a choke hold with your bow. Then tap the Interact button, as shown on screen, to finish him off. You'll gain bonus XP for a stealth kill. After Lara has unlocked the axe as a melee weapon, she'll use it in stealth attacks instead of the bow choke. To take out an enemy with a silent headshot, keep a safe distance or hide behind cover so the enemy doesn't notice Lara. Again use Survival Instinct to make sure the enemy won't alert his friends when attacked. Select the bow. Until you unlock certain upgrades, the other weapons make too much noise for a stealth attack. Hold the Aim button. Press Zoom and then adjust your aim if necessary. Then briefly hold the Fire button to build up a charged shot and release the button to fire. Of course you can also use the pistol and rifle to kill enemies with headshots, and you can perform headshots on enemies who glow red in Survival Instinct. You will get XP bonuses for both, but other nearby enemies will most likely notice the sound and come running. Distraction – When Lara comes upon a pair or small group of enemies standing around talking, it's often possible to use distraction to kill one or more of them. Then you don't have to fight them all at once. Again, select the bow since it won't immediately give away your position. Stay behind cover as you shoot an arrow into a wall or other solid object a short distance away from the enemies. One of them will usually go to investigate the noise. Then you can shoot the other one with a headshot, as described above. With any luck the one who went to check out the sound will not notice immediately and you can take him out too. Again, there's a tutorial about this in the Mountain Temple walkthrough. Dodge Maneuvers – Even before you unlock any special skills, Lara is able to dodge enemies in a rudimentary way. Just press the Dodge button (Shift/Circle/B) while moving to scramble away from attacking enemies. If you do this with a weapon drawn it's even more effective. Hold Aim to keep the enemy targeted. Then as he lunges toward Lara, press Dodge and move to the left or right at the same time. 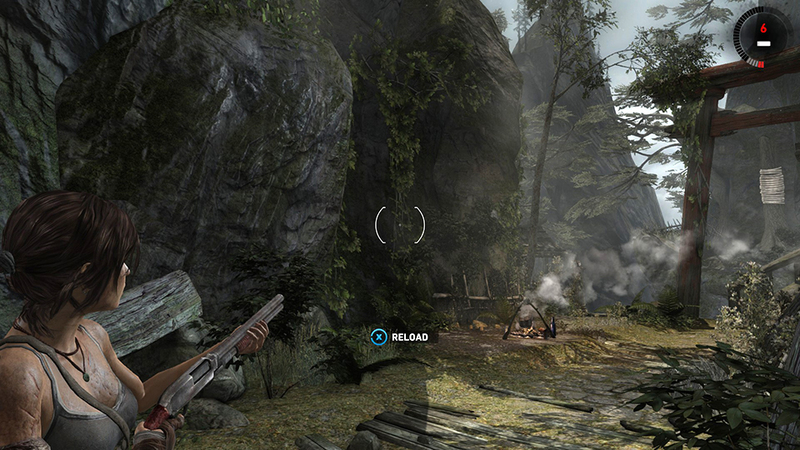 Lara will dodge and automatically aim at the enemy, allowing you to get off a quick shot or two. Finishing Moves – After a nearby enemy has taken some damage but isn't quite dead yet, the Melee icon will appear above his head. This indicates that he's stunned and vulnerable to a finishing move. Step in close and press Melee. When fighting weaker enemies, Lara will deliver a killing blow. Stronger enemies may require repeated attacks. When you kill an enemy using a finishing move, you'll gain bonus XP. Later, as you unlock more advanced combat skills, you will acquire more elaborate finishing moves involving various weapons. 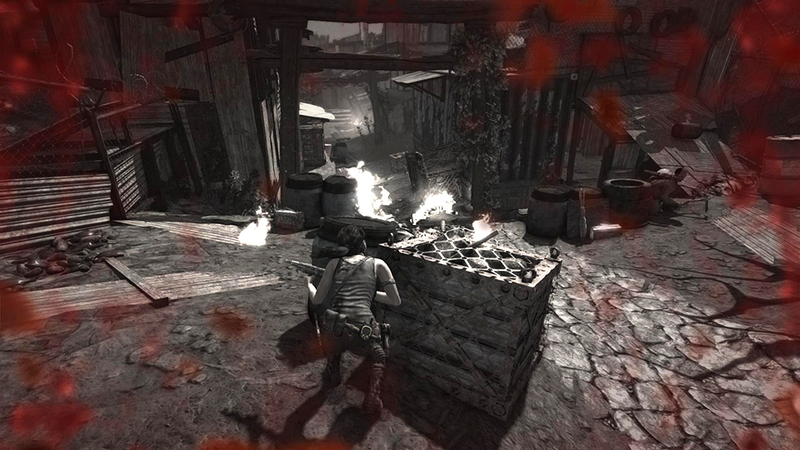 Using Cover – When enemies are nearby, Lara automatically adopts a slightly crouched, defensive stance. If you then move close to a low wall or other solid object, she'll use it for cover. Solid cover offers protection from enemy bullets. Destructible cover, like wooden walls, barrels and such, only provide temporary protection and can be destroyed by enemy fire. When this happens, you'll need to move away quickly. To shoot from behind cover, hold Aim. Lara will then peer out, enabling you to aim and shoot as usual. Peeking out this way makes Lara vulnerable to enemy fire. If she starts to take damage, release Aim to duck back down. Enemies can also use cover. You may be able to flush them out using explosives or by setting their surroundings on fire (once you unlock these abilities). Often it's possible to target just the tops of their heads even as they're crouching behind cover. You may not be able to score a full-on headshot, but you can do some damage and possibly cause them to pop out and retaliate, enabling you to finish them off. Ammunition Types – Although this is not very realistic, all versions of the handgun use the same type of ammo, as do all versions of the rifle and all versions of the shotgun. So when you upgrade a particular weapon, you can still use the ammo you have collected previously. These screenshots show the different ammo types. Ammo for the pistol and rifle come in clips of 8 and 30 rounds, respectively. Similarly, the shotgun can only be loaded with 6 rounds at a time when you first acquire it. Later, various upgrades will increase these limits. When you come to the end of a clip, the last several rounds are highlighted in red in the ammo counter, and you see an on-screen prompt to reload. (screenshot) Tap the reload button (R/Square/X) to reload manually, or just continue firing and Lara will automatically pause to reload. Note that Lara is vulnerable while she's reloading, so try and do this behind cover if possible. Again, future upgrades will enable faster reloading for the various weapons. When Lara runs out of ammunition for the weapon she's using, she'll automatically switch to another weapon, usually the Pistol, unless she also happens to be out of ammo for that gun. Alternate Ammo Types and Alternate Fire Mode – As you progress in the game you will gradually unlock new ammo types and alternate fire modes for the various weapons. I don't want to include too many spoilers here, so I'll just cover the basics. Check the Upgrades page for details. Once you have unlocked different types of ammo, press the weapon select button multiple times to cycle through the different ammo types. For example, when using the bow, press 1 on the keyboard or D-Pad Up on the controller until the arrow type you want is selected. Then aim and fire as usual. (screenshots) For the shotgun, press 3/D-Pad Left repeatedly to cycle through the different types of shotgun ammo. And so on. Alternate fire mode is slightly different. Certain upgrades let you shoot particular weapons in a different way. Examples are the burst-fire mod for the pistol and the grenade launcher for the rifle. Once unlocked, press the Alternate Fire button (R2/RB/Middle Mouse) to use the special mode. Additional combat tips are included in the walkthrough along with many screenshots. If you're having trouble defeating a particular enemy or group, I encourage you to check out the relevant level. There are 7 Challenge Tombs on the island, plus a downloadable bonus tomb described in the section on Outfits/Skins and Other DLC. Completing challenge tombs is not necessary to beat the game, but doing so yields both salvage and experience points—often enough to unlock a skill point—so they're well worth trying. 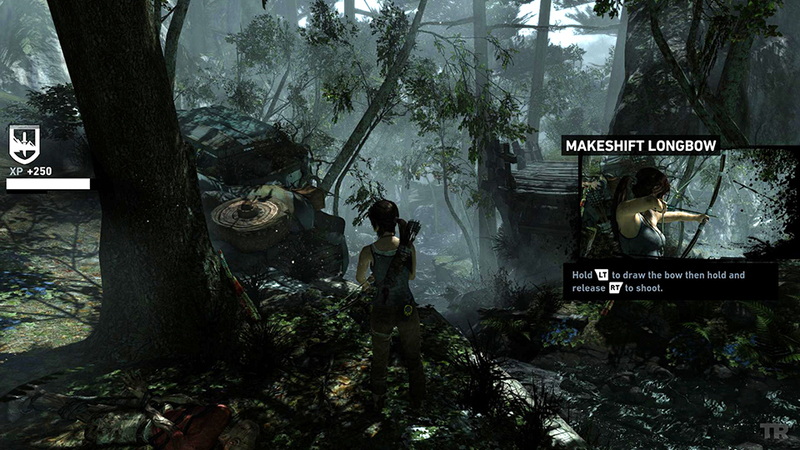 Challenge tomb locations and solutions can be found in the walkthrough. There are several categories of collectible items: equipment, food caches, weapons and weapon parts, ammunition, salvage, documents, relics, GPS caches, treasure maps,and challenge items. These are described in detail on a separate Collectibles page with links to quick guides for finding all major collectibles. The locations of all equipment, documents, relics, GPS caches, treasure maps, weapon parts and challenge items are also detailed in the walkthrough. If you get disoriented or forget your current goal, refer to the in-game map by pressing Tab on the keyboard, Select or Start on the controller. Lara's position is indicated by a green arrow. The direction in which the arrow is pointing shows the way Lara is facing. Your current objective is shown by a black-and-white diamond icon (as shown in this example). 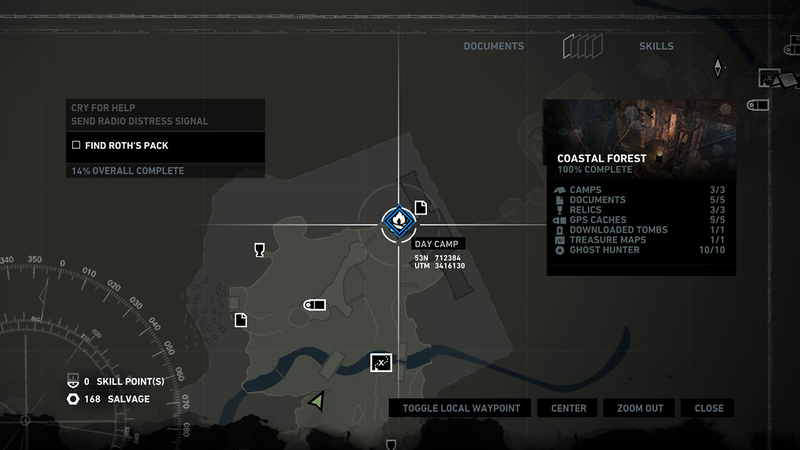 Camps appear on the map once you've located them in the game. Any documents, relics, GPS caches and Challenge Tombs you've found are also marked with little icons. Certain special skills and Treasure Maps found in-game will allow you to see some of these items on the map beforehand, making finding them much easier. The in-game map for each area also includes a map key at the top right, showing your percentage completion for that area and how many of the various collectible items and challenges you've found so far. NOTE: The in-game map does not include a compass rose showing which way is north. So when I refer to map directions in my walkthrough, I assume North is up, east right, south down, and west left. I also try to give landmarks in the scenery so you won't need to rely on the map to follow my walkthrough. While looking at the in-game map, you can pan around using the mouse or right stick, and zoom in and out with the Aim/Fire buttons (controller) or by clicking the Zoom In/Zoom Out buttons on screen with your mouse. This lets you see the whole island or just one area. To set a waypoint on the map, center the crosshairs on the object or camp you want to travel to, then press Jump (controller) or click the "Toggle Local Waypoint" button with your mouse. A blue, diamond-shaped waypoint icon will be noted on the map. 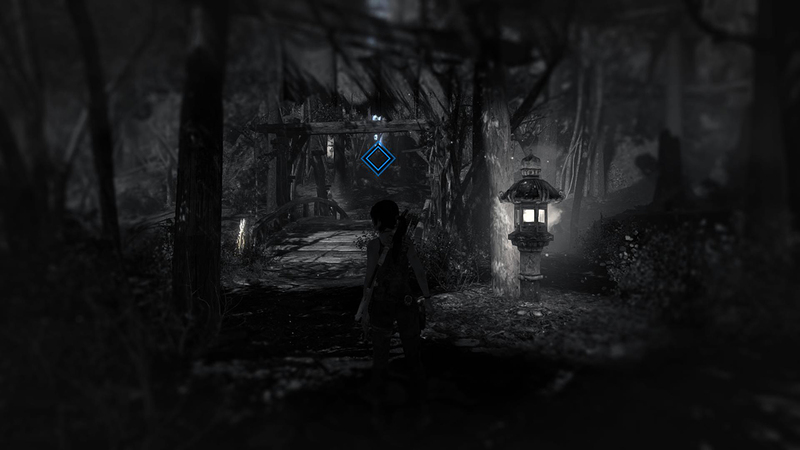 (screenshot) When you return to the game and use Survival Instinct, a blue diamond and a column of light will show the location of that waypoint in the game world. (screenshot) To remove the waypoint, select it on the map and press Jump or click "Toggle Local Waypoint" again, or just set a new waypoint and it will replace the previous one. When no waypoint is selected, pressing the Survival Instinct button will reveal the Objective Beacon, a column of light showing where you need to go next in the story. The map screen also includes several sub-screens—Skills, Gear, Relics and Documents—accessed by paging to the left or right using the buttons indicated on screen. As you'd imagine, these screens show the skills and gear you've unlocked and the significant items you've found so far. You can further examine each item by scrolling through the lists on the screen and selecting individual items. †UPDATE HISTORY: 3/13/13– Page first posted online. 3/27/13 - Updated the section on Challenge Items for clarity. 4/2/13 - Updated the section on Fast Travel. 4/13/13 - Added note on cardinal directions in the map section and the walkthroughs. 4/20/13 - Fixed PC keyboard control for rope arrows, which is actually the Space bar. Thanks to Brat352 for the heads-up. 7/7/13 - Made a few minor tweaks for clarity and added links to the separate pages for Collectibles and Upgrades. 7/15/13 - Added sections on combat, hunting and weapons, as well as filling in additional details and screenshots for the salvage sources and collectible items. Also made a few more minor tweaks for clarity and deleted a couple redundant sections. 7/17/13 - Added a link to Anton's tutorial for making the game recognize and respond to previously incompatible gamepads. 8/5/13 - Moved collectibles section to a separate page. 8/27/13 - Added note about PC patch increasing the number of save slots, thanks to a reminder from Zac. 6/25/14 - Added note about changing language. 6/14/15 - Added manuals and a few notes on controls for Tomb Raider Definitive Edition. 10/4/15 - Added note about rope arrow bug. Copyright © Stellalune. All rights reserved. Feel free to link to this page but do not copy it. To give me your feedback, send email to or visit tombraiders.net. The name and likeness of Lara Croft, Tomb Raider screenshots and the Tomb Raider name and logos are copyright © Square Enix, Ltd. All rights reserved.